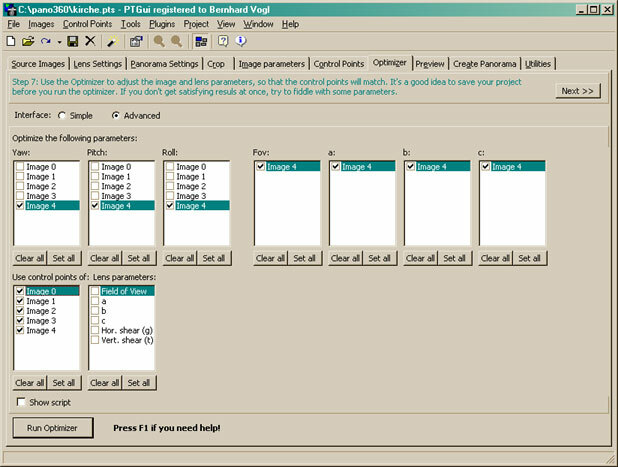 Go here if you look for an updated tutorial for PTGui V5 and above! There is one image that I haven't mentioned until now: The zenith- or sky-image. We need a special treatment for this one. We will now insert the image in our panorama, optimize it and manually add it with an image editor afterwards. Please insert the image to your panorama. Don't forget to copy the crop-circle to your added image. Also, add a checkmark under "Lens Settings" for "Use individual lens parameters" for this image (number 4). This is done because of the assumption that zenith-images heavily deviate from the nodal-point when photographing without the aid of a tilt-able panohead. 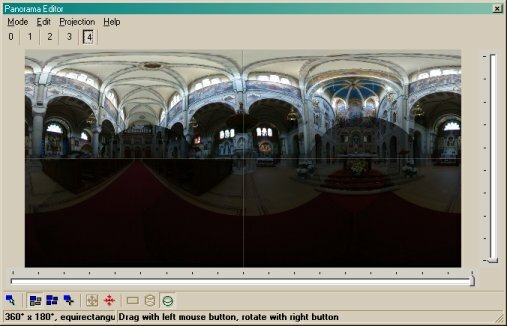 Pull the image roughly to the final destination on top of the panorama: Drag the zenith image upwards to top position (after a second, the editor will refresh and display it distributed in the upper third of the editor window). Now, drag the image left/right until it roughly fits to the lower part of the panorama. If you have no identifyable features in your image: After dragging the image upwards, enter the (rough) yaw of the image in the image property window. This is the degree reading of your panoramic head (if you used one). A rough alignment will be sufficient. You can do a smooth blending with Enblend or with the layer brush in Photoshop. Go to "Control Points" and use the right window for viewing the zenith image. On the left side you can now page through the 4 other images to set some control points. Use the "Rotate" drop-down for your convenience (which will not impact your final panorama). You don't need to get a perfect optimization. All you need are a few degrees to fill the hole in the upper center of the image. When optimizing too often, it could happen that the optimizer would get caught in a bad sub-optimum. 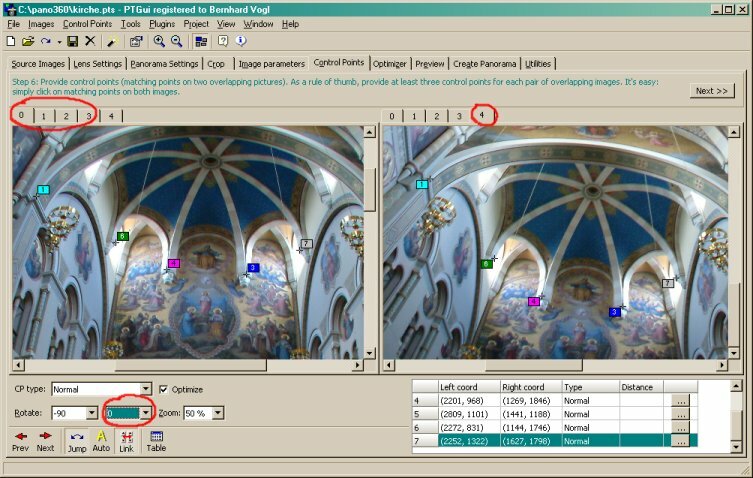 In this case, reset "Lens Parameters" (FOV, a,b,c) and retry.